My daughter drives an old Volvo that doesn’t have a port for an iPod cable. We originally got her an adapter that played her iPod via the cassette player. When it broke after a few months, we looked for an alternative. It arrived from Amazon yesterday: the Eforcity 3-in-1Charging and Car Holder FM Transmitter. She plugs it into the car’s cigarette lighter (yes, the car is old enough to have one of those), tunes the radio to an unused frequency, and plays her music through the radio. 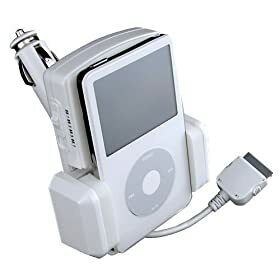 Set your iPod in the cradle, and adjust the arms on each side so they hold the iPod firmly. Plug the cable into the iPod. Plug the cigarette-lighter adapter into the car’s cigarette lighter. Turn on the car radio, and locate an unused frequency. Turn on the iPod, and you’re ready to rock. Insert some cigarette ends of iPod car kit in some cigarette devices of automobile of yours, and adjust the suitable angle, so that your convenient operation iPod. Draw back both arms, put your iPod into and equal to the urgent both arms , let your protection firmly of iPod among them . Will charge the plug and connect it on the base interface of iPod, in this way you can charge while listening to the music . Choose the transmission frequency of this equipment according to the local frequency situation of radio station , the switch is presetting frequency to stir the frequency band , try one’s best to avoid the frequency of the local strong radio station , then open wave band , FM of auto radio , of you , is it search platform or manual to search set let auto radio of you receive frequency that you preset automatically to choose, in this way you can listen to iPod stereo music of high-fidelity taken the place of to you through iPod car kit device . Establishes you in cradle aspect iPod, on adjusts the arm nearby each, therefore they have iPod firmly. The plug enters to the iPod wire. The plug enters to automobile’s cigarette blasting machine’s cigarette blasting machine switch. Turns on the car radio, discovers frequency which has not used. Is decided in iPod, prepares the jogging with you. I think that (thankfully) technology has a long way to go before the writer/editor’s job becomes obsolete. We have children; therefore we have iPods. We bought our daughter her first iPod for her 13th birthday; with it, thank goodness, we purchased Best Buy’s Performance Service Plan. I’m not normally one to pay for extended warranties, but the salesguy warned us that iPod hard drives don’t last long and pointed out that teenagers have a tendency to drop things — and the plan covered normal wear and tear. My daughter’s iPod lasted about 6 months and then died with no warning. I returned it, and after a brief check Best Buy handed over a brand-new one. Another six months went by, and, just like the first one had, the second iPod went belly-up. By this time, Apple was no longer making the original model, so my daughter received a brand-new video iPod — an upgrade that cost us nothing extra. The new computer: an eMachine T5212. (The company is owned by Gateway.) Got it at BestBuy after significant hours spent researching prices. We didn’t need a monitor, so this was the best way to go, with a much faster processor and hugely larger hard drive than our old PC. Not yet available at the Gap or Hot Topic, but still very cool: the wearable instrument shirt. In other words, a t-shirt that bring your hottest air-guitar riffs screaming to life. Our air guitar consists of a wearable sensor interface embedded in a conventional ‘shirt’, with custom software to map gestures with audio samples. It’s an easy-to-use, virtual instrument that allows real-time music making, even by players without significant musical or computing skills. It allows you to jump around and the sound generated is just like an original mp3.